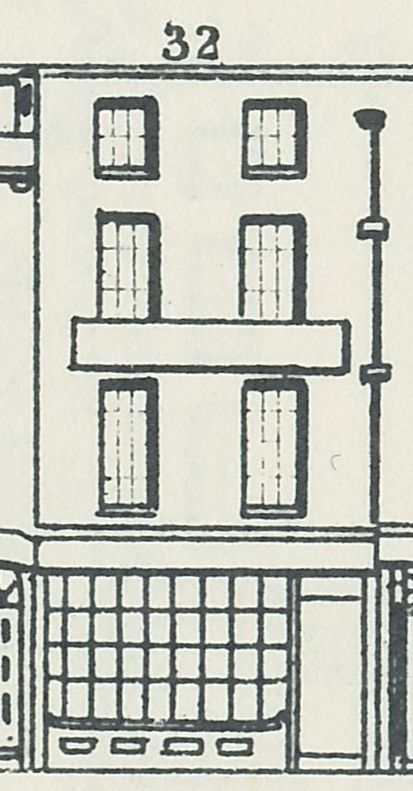 In 1822, in Pigot’s Directory, Barklimore could be found at 4 High Street, Bloomsbury. 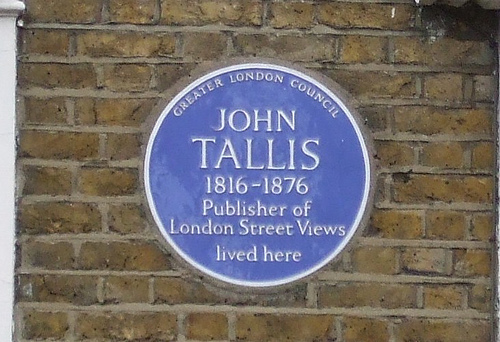 The Tallis index mistakenly lists him at 4 Broad Street, but every other resource, such as the Land Tax records, has 4 High Street as his address. In 1827, Barklimore married Hessey Owens at St. Mary’s, Dover, Kent. According to the announcement of the wedding in The Standard, she originally came from Ireland. In that same announcement Barklimore is listed as of Charlotte Street, Bloomsbury. Hessey died in 1830 and as far as I know, Barklimore did not marry again. The Electoral Registers for 1832-1837 also give Barklimore’s address as 10 Charlotte Street. And so does Pigot’s Directory of 1839 which gives Wm W. Barklimore at 4 High Street. Who he is, remains a mystery, and he is not mentioned in Robson’s Directory of 1839 which lists Archibald Barklimore at both 10 Charlotte Street and 4 High Street. Barklimore cannot be found at 4 High Street in the 1841 census, but he is resident in Charlotte Street, which would suggest that the latter address was his home and 4 High Street his surgery. 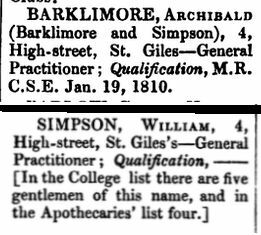 In The Medical Directory for 1845 and in the one for 1846, Barklimore’s name is joined to that of William Simpson, but that partnership had already been dissolved in 1842. 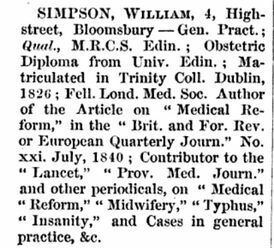 Simpson was apparently a common name among doctors and Simpson’s qualifications could not yet be listed in the 1845 directory, but by 1846, they had worked out which of the Simpsons he was. Note that he is still given the address of 4 High Street. Barklimore’s entry is an exact copy of the 1845 one. The British Medical Directory for England, Scotland and Wales of 1853 gives Barklimore as ‘retired’. 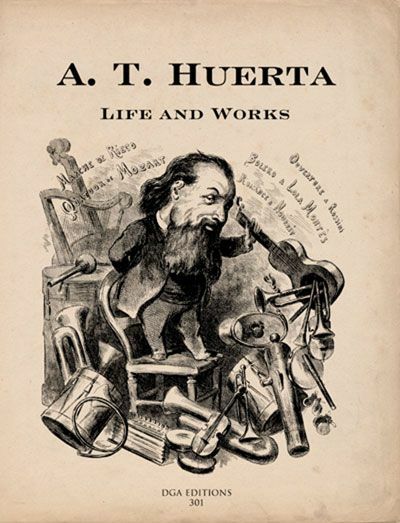 He died on 2 April 1864 at the age of 86 at Old Quebec Street. (6) A notice in the Belfast News-Letter of 8 April of that year, mentioned that he was the only son of Hugh Barklimore, late of Whitehouse, parish of Carnmoney, which precludes the illusive Wm. W. being a brother. So, Archibald Barklimore originally came from Ireland, but lived most of his life in London. (1) University of Edinburgh: Matriculation Album, 1786-1805. (2) Roy Adkins, Roy & Lesley Adkins, The War For All The Oceans: From Nelson at the Nile to Napoleon at Waterloo (2006), unpaginated, but about halfway. (3) University of Edinburgh: Matriculation Album, 1786-1805. Tentamen medicum inaugurale, de Pneumonia, 1800. (4) Invoice offered by Richard Ford (accessed 6 May 2016). (5) The Morning Post, 26 April 1839. (6) England & Wales, National Probate Calendar (Index of Wills and Administrations), 1864. 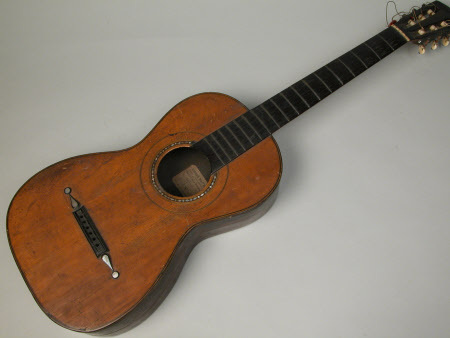 Estate valued at under £4,000. The index page to Tallis’s booklet 27 lists George Cramp at 22 Broad Street, but that is a mistake. 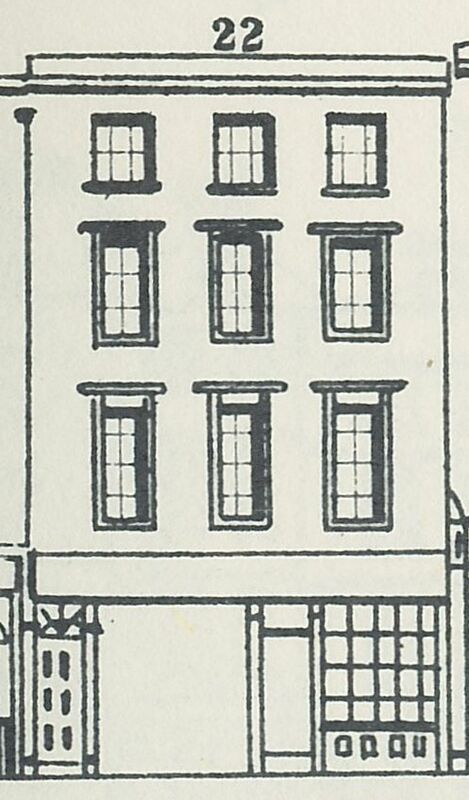 In every resource I found, and indeed on Tallis’s own street plan, Cramp is given the address of 22 High Street, Bloomsbury, also known as High Street, St. Giles. Mr. Cramp has not left many traces behind of his existence, so I am afraid his biography will be rather short. The 1841 census for 22 High Street tells us that George Cramp, 45 years old, not born in Middlesex, with an occupation so faded that it could be anything, is living there with Liddey Cramp, 40 years old, also from outside Middlesex. A Charles Hunter, 5 years old, appears to be living with George and Liddey, but I have not found out what relation he was of them. As you can see from the elevation above, number 22 was a rather large house and more people are listed at that address in the census, but they do not seem to have anything to do with the Cramps, nor are they listed in Tallis. Ten years later, in the 1851 census, Cramp is living at number 24 (I’ll come back to the move later), he is now 56 years old and clearly listed as a coal dealer. His birthplace is given as Branstead (Brasted? ), Kent. His wife, now called Lydia, is 50 years old and originally from Norwich, Norfolk. Living with them is Sarah Eley, an 80-year old widow, also from Norwich and described as ‘mother’. This gave me a clue to Liddy’s maiden name(1) and led to the marriage registration for George Cramp and Liddy Eley on 26 July 1845 at St. Martin’s in the Field, Westminster. Yes, indeed, long after the couple were listed together in the 1841 census and one can only speculate why they got married at St. Martin’s rather than at their local church, St. Giles’s. There is one other snippet of information to be found about George Cramp, and that is that he was summoned to serve on the Traverse Jury at the Middlesex Sessions of the Peace on 23 July 1850. (5) A traverse jury is one that is chosen for just the one case, but which case that was in Cramp’s case is unclear. No more is heard of George and his wife Lydia after the bankruptcy proceedings; I have not found anymore census records for them, nor any death registrations, so what happened to them is uncertain. Did they emigrate? (1) Lydia Ely was baptised 31 May 1799 at St. Margaret’s, Norwich, the daughter of Benjamin Ely and Sarah Rovell. I have not discovered any baptism records for George. 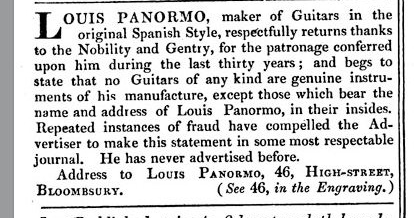 (2) London Gazette, 21 January 1851. (3) London Gazette, 28 January 1851. 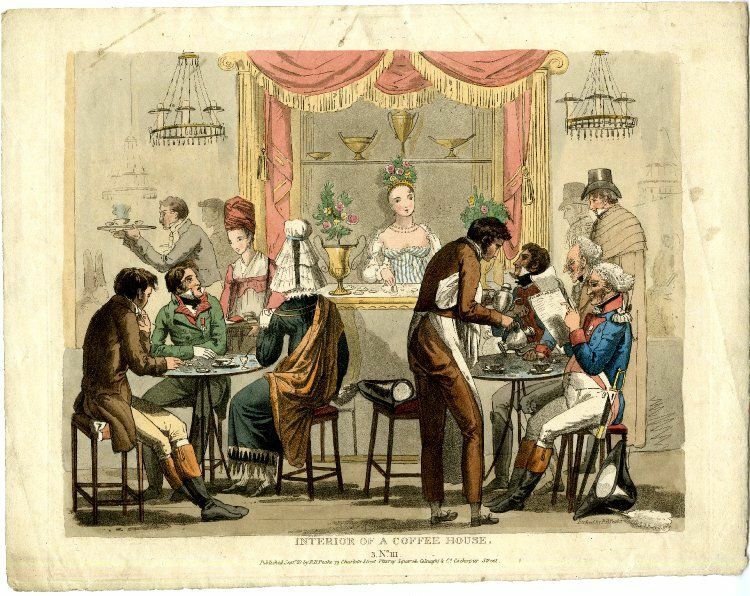 (4) Victorian London published W.J. 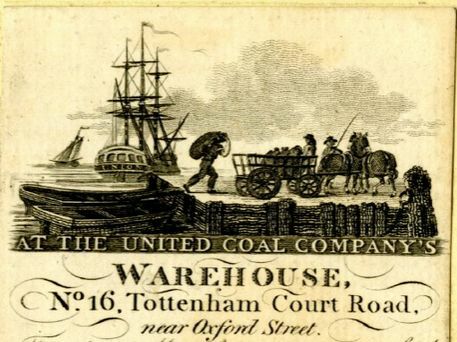 Gordon’s The Horse World of London (1893) with chapter 10 on The Coal Horse (see online here). 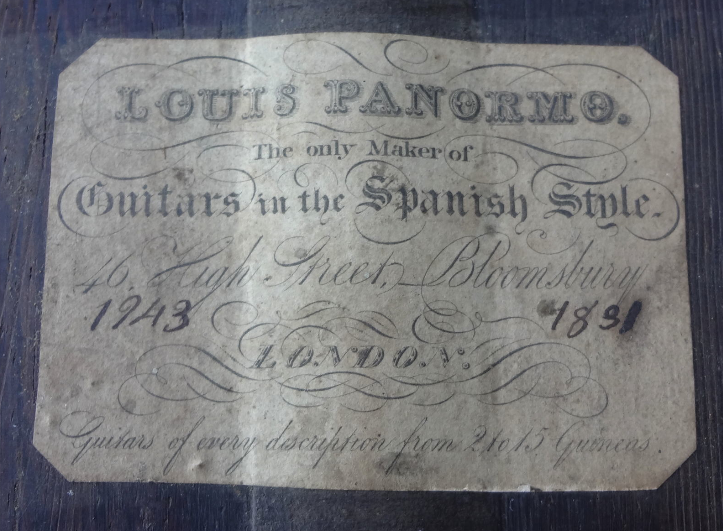 (5) London Metropolitan Archives, MJ/SP/1850/08/005. The 1841 census tells us that Charles is 52 years old, not born in Middlesex, married to Jean (also called Jane) who is 53 years old, and that the couple have five children living with them (Matilda, 23, Richard, 21, Martha, 19, Asa, 17, and Thomas, 14). They are living in Boziers Court, a small road behind a block of houses on the corner of Oxford Street and Tottenham Court Road. See The Cat’s Meat Shop for more information on Boziers Court. 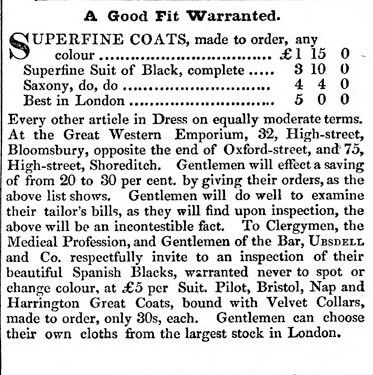 By then, that is by 1841, the Ubsdells had moved their Emporium from High Street, Bloomsbury to 1 & 2 Oxford Street. The shop in Shoreditch is no longer mentioned in the advertisements. Nothing spectacular happens in the tailor’s shop at the Great Western Emporium as the shop is still called, but that cannot be said of the personal life of some of the Ubsdells. 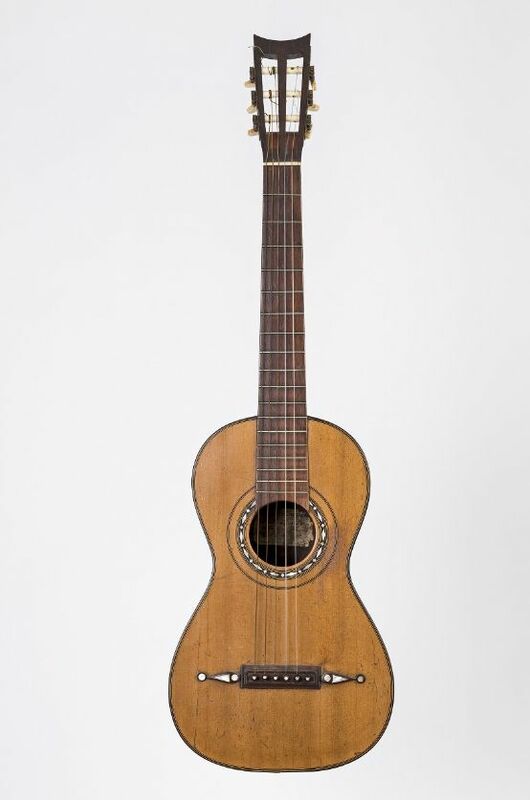 Matilda, the eldest daughter went off in 1842 with “a Noble Lord, the younger son of a Duke, to Ireland, where she lived with him for some months, and having become enceinte by him, she returned to this country and was delivered of a boy”. (2) Matilda sued the young Lord for breach of promise and was paid 300l. to hush it all up. She assumed the name of Mrs Black and with her younger sister Martha set up as milliners at 113 Park Street, Camden Town. In 1844, she met a young man who worked as a clerk in the goods department of Ely station and they became engaged. The engagement was, however, broken off and they did not see each other for a while. They renewed their engagement in 1846 after a chance meeting and the wedding day was fixed for September 1847. The millinery business was advertised for sale and the money raised was to be used for a house. On the 8th of August, Matilda received a letter from her young man in which he wrote that he thought they should acquaint her father with the engagement. Apparently they had kept it a secret. Why one wonders? Mr. W.R. Carr – the young man’s first name is not mentioned – wanted to get their financial future on a better footing and he thought that Matilda might “be furnished with 800l. or 1,000l.” He stresses that he does not want the money for himself, but for “the society I shall have to enter into and other things”. Matilda was not having any of that and she alleged that the letter amounted to a refusal to marry her and she consulted an attorney who wrote to Mr. Carr threatening proceedings, but also offering a way out if money were to change hands. In other words, Matilda thought she could get some money out of a second young man for another breach of promise. 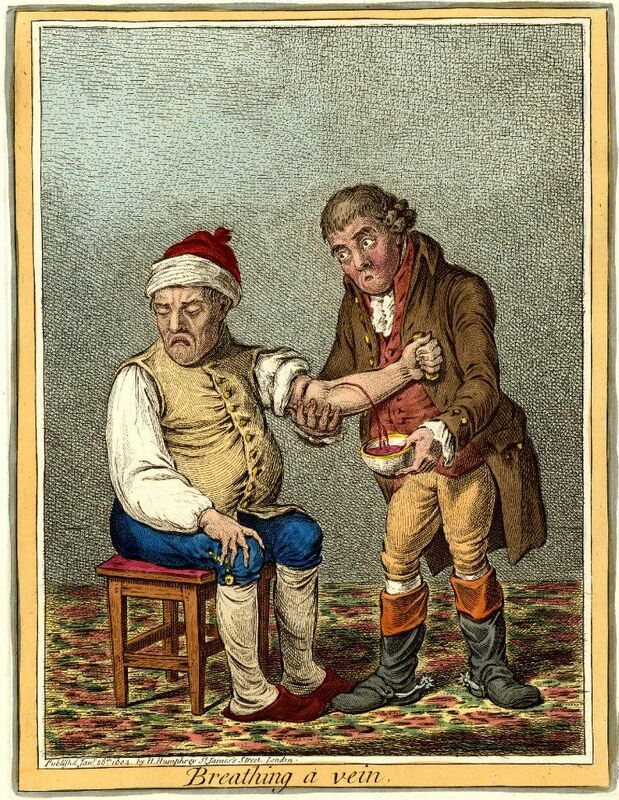 But this young man was not such a push-over as the Irish nobleman, or had less to lose, and it came to a court case. The defence stated that Mr. Carr had not known of ‘Mrs. 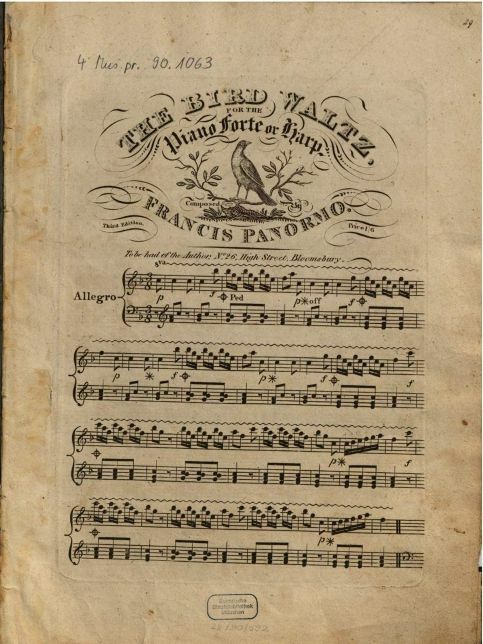 Black’s’ earlier history, but had thought her to be a young widow with a child. Witnesses were called to refute that claim as Matilda had frequently been called by her maiden name in front of the defendant and her young son had been called by his father’s real name. Two witnesses said that Carr had told them he knew of Matilda’s previous history but “that it would make no difference in his respect and esteem for the plaintiff”. The defence claimed that “it was not likely that with the knowledge of so serious a lapse of virtue on her part as consenting to live as the paramour of another man defendant would have entered into this engagement.” Chief Justice Wild considered the fact that this was Matilda’s second action for breach of promise and that she had entered this second one under her assumed name of Mrs. Black, giving the world the impression that she was a widow. She should have made the real facts known to the defendant and “as to the question of damages, if it should arise, plaintiff’s feelings were not likely to have suffered so severely as if this had been her first appearance in court as plaintiff in an action of this nature. 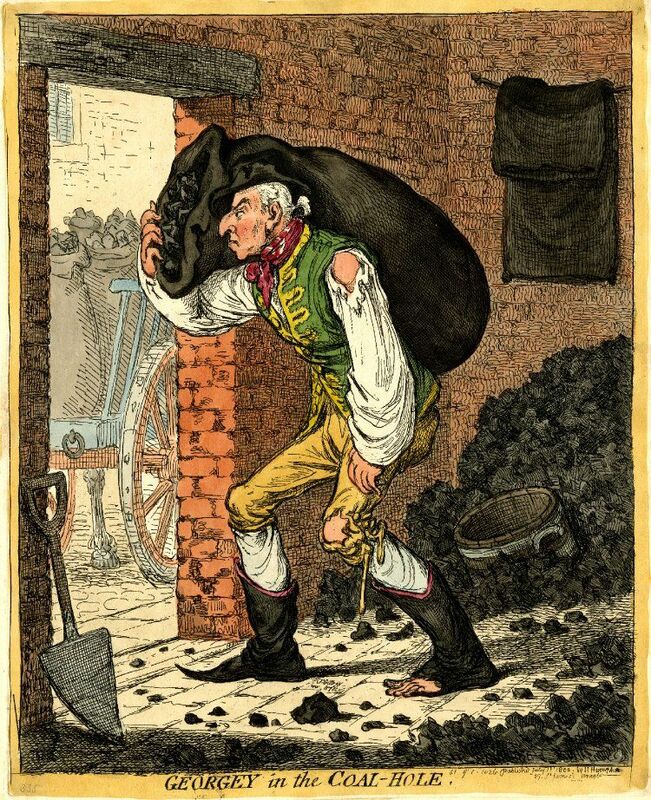 Verdict for plaintiff – damages one farthing”. (3) Not quite the 300l. she might have hoped for! If you now think that Matilda went on to lead the quiet life of a spinster, or even an assumed widow, you are wrong. The same year as the court case againt Carr, she managed to get her hooks into one John Lymes, a widowed coffee house keeper. The couple got married on 7 December 1848 and presumably lived happily ever after as Matilda’s name did not appear in the papers again. Back to the Western Emporium on Oxford Street. In the 1851 census, we can still find Charles and his wife Jane at Boziers Court. Living with them are sons Thomas and Asa, and daughter Martha and her husband Jonathan King whom she had married in 1850. I am afraid things did not go well for Charles Ubsdell after that. Whether that had anything to do with the shenanigans of his daughter which lost him customers, or whether he just fell foul of the debit/credit balance is unclear, but in early 1853 he is confined to the Queen’s Prison as a bankrupt. (4) And this story is unfortunately not a fairy tale and so does not have a happy end; in 1877, Charles dies on the 31st of March, 86 years old, at the Saint Pancras Workhouse. Life was not kind to this particular London tailor. 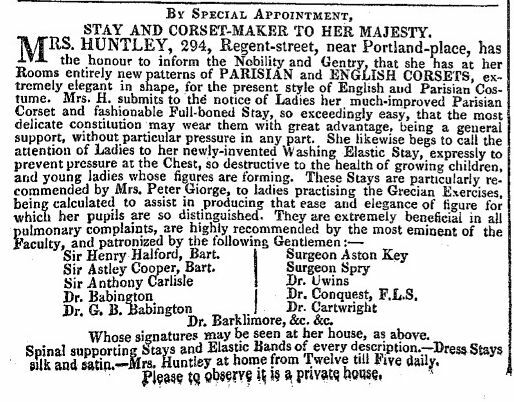 (2) the Morning Post, 17 May 1848. (3) Lloyd’s Weekly, 21 May 1848. (4) London Gazette, 11 and 21 January 1853.